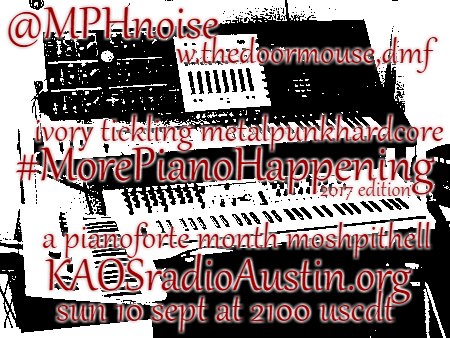 #MorePianoHappening ’17 celebrates pianoforte month with killer new keyboard crushers by Paradise Lost, Vintersorg, Xandria, Persefone, Unfear, Serenity in Murder plus classic keyboards cranking out the mosh by Soilwork, Dark Tranquility, Bleeding Through, Still Remains, Savatage, Animations, Appearance of Nothing, Battlelore, Unsun, Nightwish, After Forever, Evergrey, Type O Negative, Amorphis and more. 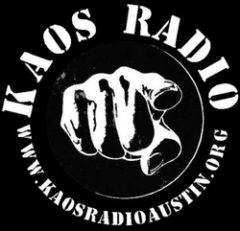 Learn some music history about the piano, how to support pianosforeducation.org and more while you get your ivory tickling mosh on. 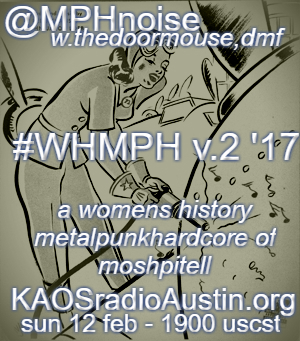 #WHMPH continues the celebration of Women’s History Month with new tracks by Xandria, Kalida & Leaves Eyes plus classics from Unexpect, Trail of Tears, Nightwish, Battlelore, Unsun, Karnataka, the Reasoning, Baliset, Octavia Sperati, Paatos, Antimater, the Great Dischord, Peccatum, Gospel of the Witches, After Forever, Within Temptation, Darkwell, Theatre of Tragedy and more. Learn about the founding of the Girl Scouts of America, www.girlscouts.org, on it’s anniversary as well as how you can support the organization’s mission and more.